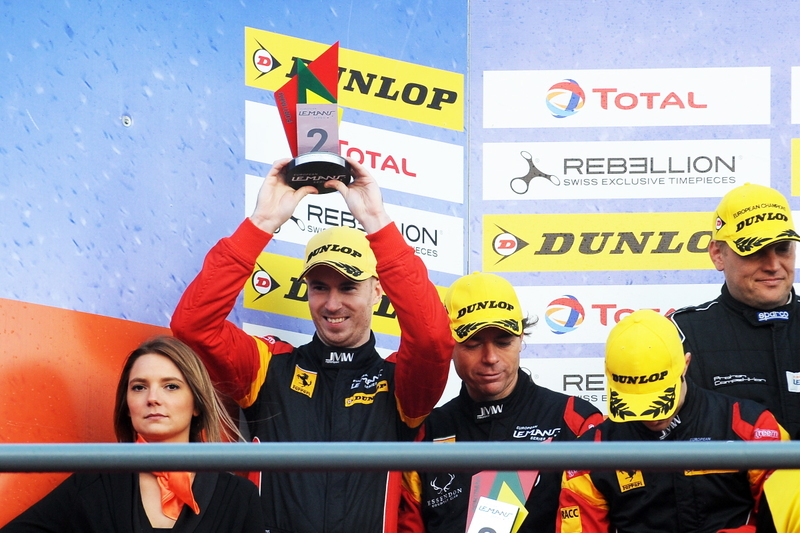 Former European Le Mans Series LMGTE Champion Alex MacDowall just missed out on making it two titles in the space of three years during the final round of the season at Portimao in Portgual on Sunday, 28th October, but did celebrate a welcome podium return for top squad JMW Motorsport. Racing to a second place finish in round six of the season at the Autodromo Internacional do Algarve along with JMW Motorsport team-mates Miguel Molina and Liam Griffin, the Ferrari F488 LMGTE trio concluded the campaign just 7.5 points shy of the title as 2018 Vice-Champions. “Red Bull Ring, where we had to retire due to mechanical failure, was the race that screwed it up for our championship, but you can’t predict these things and we did the best we could this weekend”, said Carlisle’s MacDowall, “We put our car on pole, kept the pressure on them [No.88 Proton Competition squad] and without that no-score earlier in the year we would have been champions. Lapping strongly in official practice on Friday, 26th October, and Saturday, 27th October, with top three and top two pace, the JMW drivers headed into qualifying with high hopes and they were borne out superbly by Molina with a fantastic lap of 1m42.765 seconds securing the LMGTE pole. Marking the Spaniard’s second pole position of the season, it also ensured a bonus point for the JMW drivers meaning the gap to the top of the championship closed to 10.5 points ahead of the four-hour race on Sunday afternoon. In bright but cool conditions, Griffin took the opening stint of the race from the head of the grid but slipped back to fifth early on and then sixth. With a significant amount of time lost to the title rivals, the challenge was ratcheted up a notch and MacDowall climbed aboard the Ferrari with just under one hour and 15 minutes of action completed. Doing his best to close the gap to the cars ahead, the Briton held fifth and did eat into the advantage but an unfortunate touch with an LMP3 car resulted in a spin for the latter and led to a frustrating drive-through penalty which MacDowall served at the halfway point of the race. Following a brief Full Course Yellow cautionary period, the action resumed and MacDowall had the unenviable task of trying to recover around 25 seconds to get on terms with the cars ahead, at that point holding fourth in the Ferrari ahead of the championship-leading No.88 Porsche. Decimating the gap to the Spirit of Race Ferrari ahead, MacDowall produced some scintillating laps and duly got ahead of the rival car into the LMGTE podium placings, and within 10 seconds of the top two, with just over 90 minutes to go. Then edged back to fourth by the No.88 Porsche, MacDowall remained glued to his title rival and piled on the pressure before re-taking third a few moments later. Pressing on to build a gap, racing then fell under Safety Car conditions with one hour and 20 minutes to go and MacDowall moved up into second in LMGTE. After handing the car over to Molina for the final stint, the Spanish racer was third following the driver change pit-stop and after climbing into second a late stop for a top-up of fuel was required. Pushing hard, Molina went on to end the race second in LMGTE to mark a welcome podium return.